On the bamboo rodbuilding side there is quite a lot to tell about: As already mentioned John Bokstrom started bamboo rodbuilding in 1974, at times when there still was no Garrison book available. It is easy to imagine that it must have been a lot more difficult to get off the ground with bamboo rodbuilding as a beginner than it is today, when many tools can be bought and knowledge is easily available through books, rodbuilder's meetings and notably the Internet. So, he is an essentially self-taught rodmaker. The nearest help he could find was rodmaker Dawn Holbrook who lived south of the border in Seattle, Washington, a 3 hours car drive away from John's house. Dawn turned out to be a helpful guy, providing John with his first bamboo and words of wisdom that every new rodbuilder needs so badly. But the spatial distance between Seattle and John's place was too much and allowed only 2 or 3 visits. So he had to struggle along for himself and planed his first fly rods on a set of Herter's fixed type planing forms. 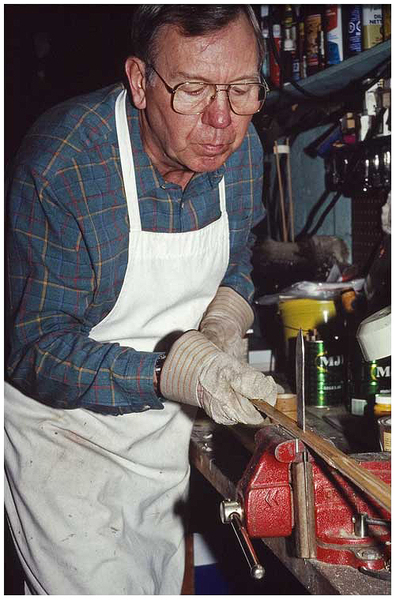 Success made him hungry for more, but above all he strived to get more and better control of the process of designing a bamboo fly rodÃknowing about the line size and action of a rod before actually starting to make it. When finally the famous Garrison / Carmichael book hit the shelves in 1977, John was especially excited with the section on taper design. He was fascinated with the precision and control Garrison had with his method of calculating the taper dimensions. He bought a calculator to do the cube roots and carefully worked his way through an 8 foot rod for a 5-weight line. The results were satisfactory, but later on he thought about modifying the taper to suit his needs which meant changes to the stress curve and introduction of more empirical numbers. This in turn would have meant that the final result would have been very empirical as well. The general calculation methods Garrison used for his taper calculations were very common at his times. There were no computers available then and engineers of Garrison's generation had to base their calculations on commonly known scientific formulas, but also had to introduce empirical numbers and formulas that derived from practical experience to suit their needs. So making further changes to Garrison's design method would not add to always end up with predictable results, something John was looking for. Furthermore one has to take into account that Garrisons calculation method is a totally static approach to solve a dynamic problem. And there is no doubt that a bamboo fly rod is a very dynamic object when in use.